Can I admit sometimes I find the American whiskey industry just a tad confusing? Rather than distinct distilleries, we stumble across brands which may (or may not) be from a particular state and/or distillery or possibly a blend of several, made from barley or corn or rye or wheat a mix of many grains. Throw change in ownership or associations into the mix and it becomes even more confounding. Such is the case with Bib & Tucker... Is it American? Yes… It was originally the brainchild of California’s 3 Badge Beverage Corp (previously 35 Maple Street with a Canadian connect), initially reputed to be bourbon from an undisclosed distillery in Tennessee… or was it Kentucky? A different cask bottled at 64% was reputed to be from Kentucky Springs Distilling Co with a mash of 70% corn, 26% rye and 4% malted barley. The grains were distilled twice – through a column still and an old-fashioned copper pot still – then matured in No. 1 charred American white oak barrels… in other words charred for the least amount of time ie approx 15 seconds. Whereas the one we tried clocked in at whopping 66.6% and I certainly couldn’t track it down… which isn’t so surprising given there are only 159 bottles of this particular expression in existence! Overall? We thought it has quite an interesting nose that evolved as it opened up. And what a reaction to the 1st sip! The first gent to dive in had taken a good swig – burst out with “Woah!” and looked like he had been kicked by a mule. I kid you not. But slow down and take a wee sip? And be rewarded with a lovely flavourful rolling spice fire in your mouth. This one certainly grew on us… and after the cigar was part-way through, most switched to the Bib & Tucker to pair and puff away the balance of our evening. aroma BIB & TUCKER leads with a strong vanilla scent along with fresh cut sweet grass, wet stone and old leatherbound books. taste With a smooth entry, the bourbon is nicely balanced with a hint of sweetness. It fulfills the promise of its nose before evolving into a warm, lightly crisp,spicy sensation. 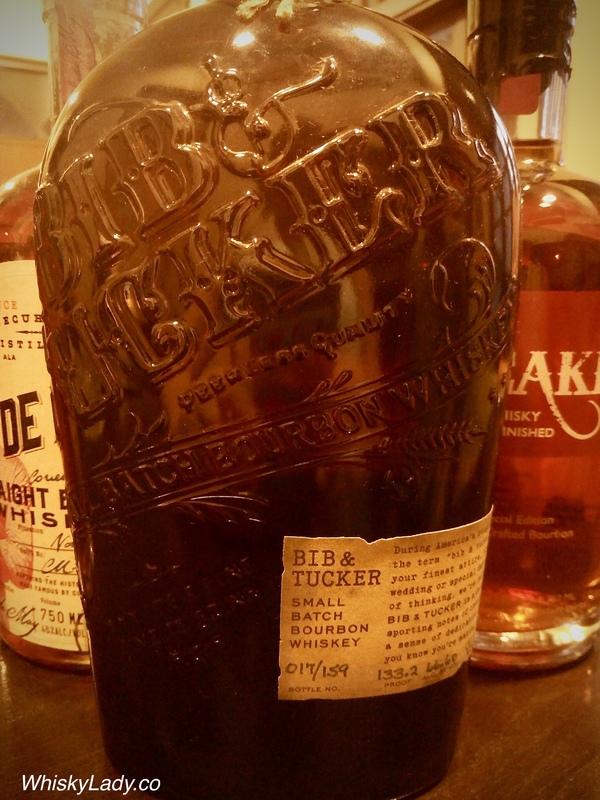 finish BIB & TUCKER lingers in the mouth with a complex, yet balanced chestnutty taste. While not the same expression, can certainly see some similarity in profile between the standard 6 year vs the 10 year one we tried. 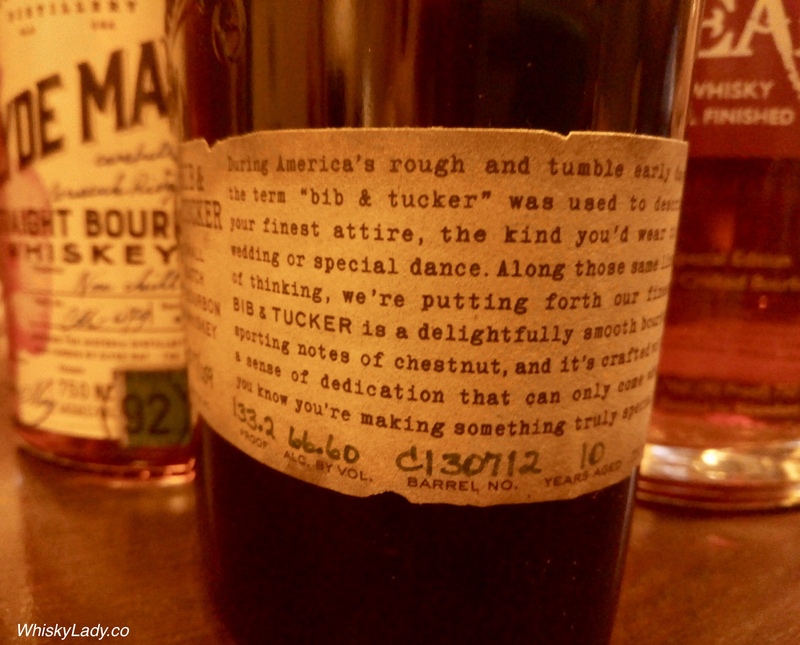 This entry was posted in American, Beyond Scotland, Bourbon, Whisky General and tagged Bib + Tucker, Bourbon by Carissa Hickling. Bookmark the permalink.